A distinguished professor at the Institut des Hautes Etudes Scientifiques (IHES) demonstrated an interesting mathematical toy. It consisted of 6 L-shaped pieces, each of which could be attached to one end of another, making a 3D polygon where all angles were 90 degree angles (at the elbows of each L). At the points of contact, where two legs of different L's form a straight line, the only motion possible was a twisting rotation. When arranged initially as 6 edges of a cube (each edge being two legs of two different L's), there were two possible choices. For the choice of initial position, shown in the second picture below, the object is rigid, and will not flex at all. 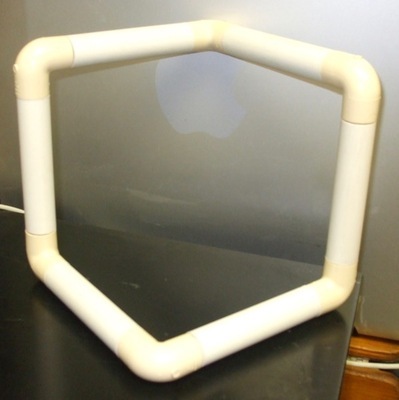 The version of this toy was made using wooden dowels, PVC pipe corners and tubes, and strong neodymium magnets and steel washers. 10 L's were made to experiment with these right regular 3D polygons with 6, 7, 8, 9 or 10 edges. The motion can be quite complex for larger polygons! Analysis of the possible positions leads to some rather deep mathematics.